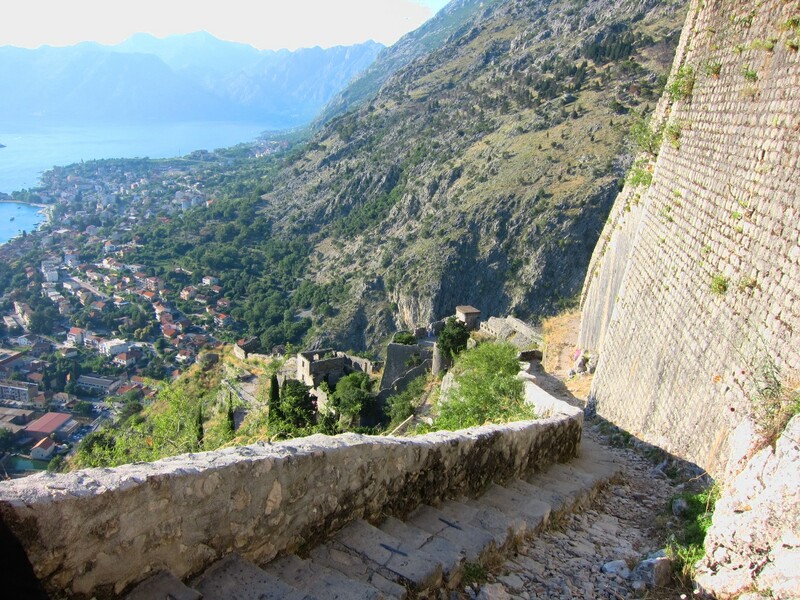 One evening after spending enough time in Kotor’s Stari Grad (Old town), we decided to walk off our excesses and hike up to the Castle of St John. The views from the top, we were told, were stupendous. 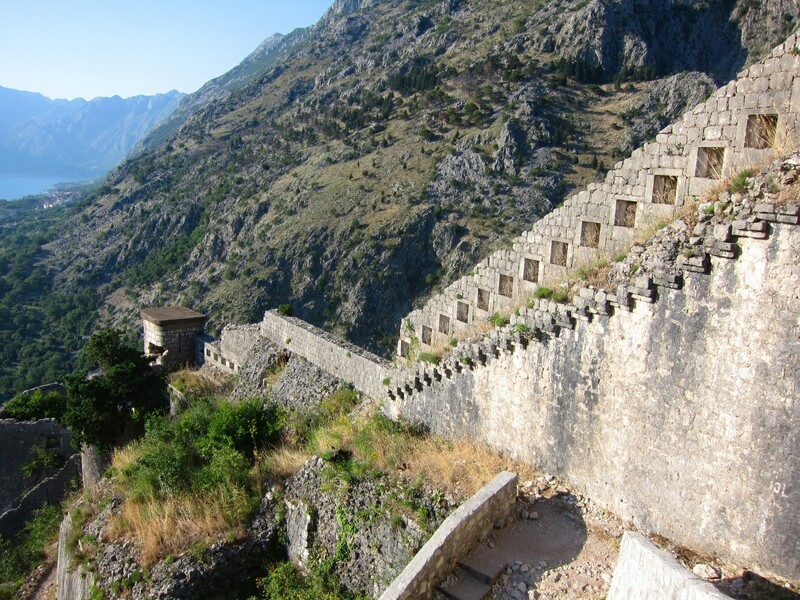 But this means climbing the formidable walls of the Kotor fortress. Gradually built over ten centuries to wrap around the entire town, these fortifications stretch for 4.5 kilometres. In other words, that’s a lot of WALL. 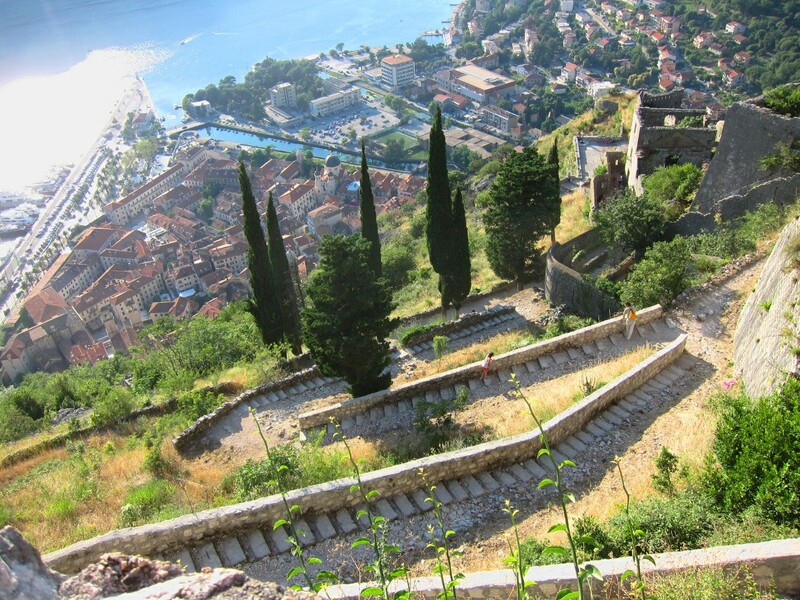 And not only that, to ascent the steep cliff face, you will be grinding out 1,350 steps to the top. Of course, you can choose the rocky path besides the steps but they are a bit treacherous too.Either way, you will be ascending 1,200 metres which in anyone’s language is heaps. So, when you hand over your entree fee to a young teenager sitting at a small table, don’t bother asking how long it is going to take. Just take the brochure and go otherwise you’ll be wondering how in the world can anyone do this in 45 minutes! There are two possible entrances to the start of the hike. We decided to start our walk at the North Gate under the decorative arch behind the church of Santa Maria. 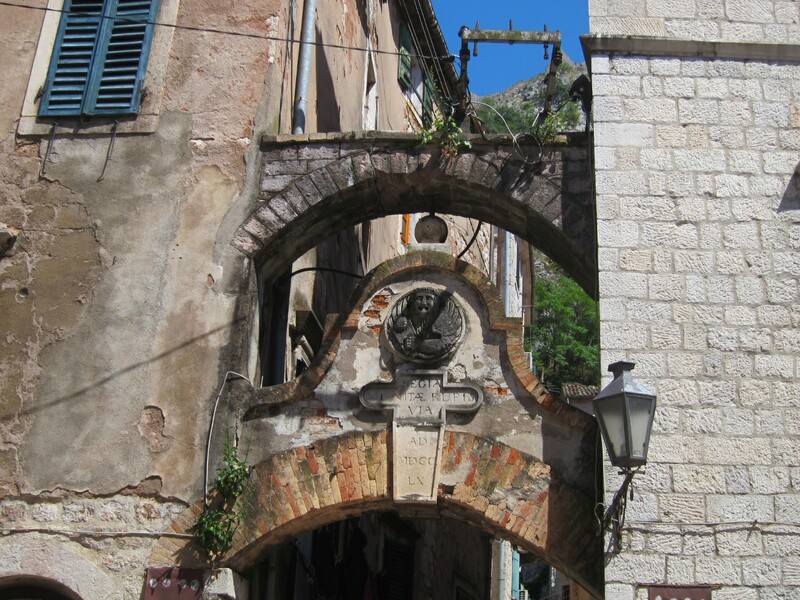 Or rather we got lost again (remember this is Kotor old town) but ended up fortuitously here. 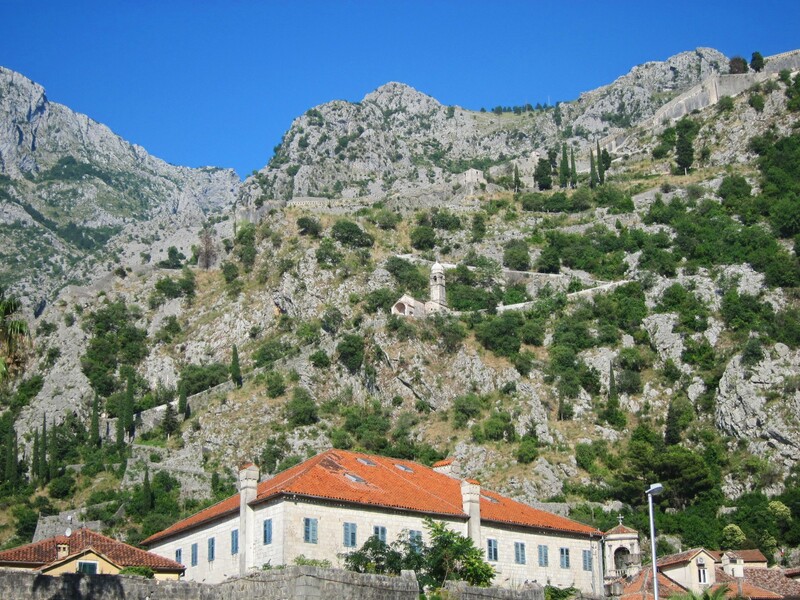 Then it is a 500 metre hike up to the Church of Our Lady of the Health. Dating from 1518, this church’s name is most appropriate as the serpentine staircase that leads you here will certainly tell you your state of health. At that time we had been training for our 10km run back in Melbourne and so we weren’t exactly slobs. But even then we felt challenged. Most stop and turn back from here as the views from the church are simply quite marvelous. But we were determined to push on. Even though it was late afternoon, the sun was still hot and there’s not much shade along the way. With our legs getting tired, we just took our time whilst giving Aidan permission to gallop ahead. After huffing and puffing another 700 metres we finally made it to the Castle at the top of the hill, some 260 m above sea level. The verdict? It is definitely worth the effort. 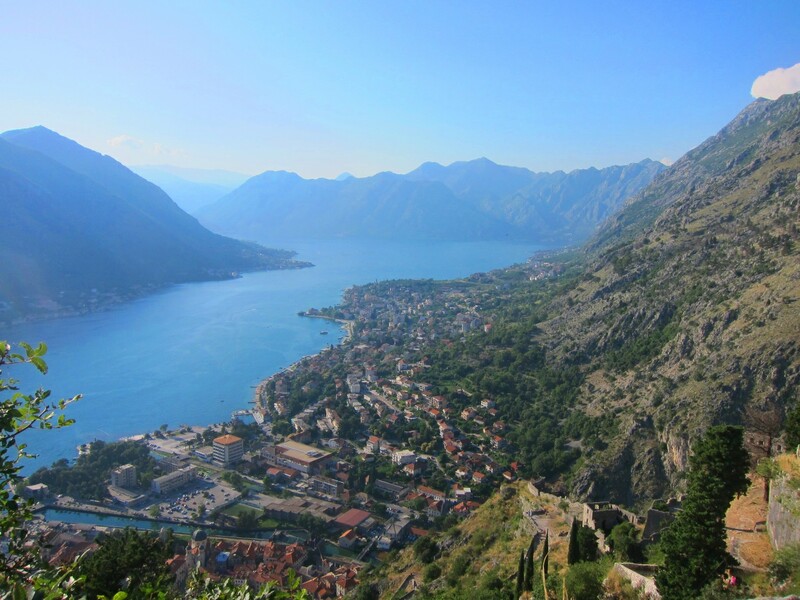 The panoramic vista of Kotor and the bay extending outwards towards Perast is simply breathtaking. So, don’t give up halfway but go all the way to the top. Hiking in the morning is probably better as the sun will be behind the mountain and you will be walking in the shadow. You also won’t get the sun when taking photos of the bay. Take it easy. It is not a race and you are on holidays after all! Wow, again, your photos are breathtaking and I’m itching to go there now! How long would you say did it take you in total? We stayed for 3 nights in Montenegro. 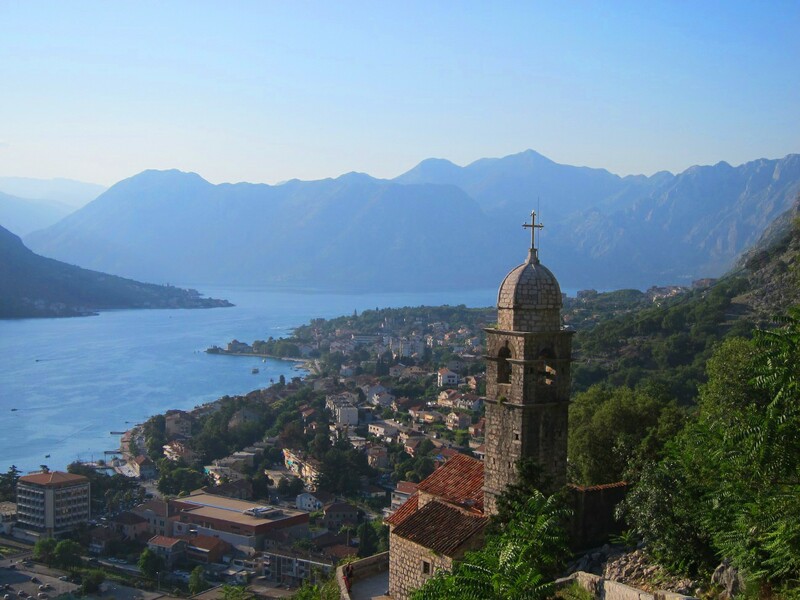 I think we would have visited the mountains if we had more time (see Ostrog Monastery) and also given Budva a miss. So I reckon 3-4 nights would be good. By the way, thanks for the compliment on my photos. Some destinations do lend itself to just great shots.